A silver maple helicopter seed rendered from life lilts in at left. A chart of the change in total U.S. household debt in trillions of dollars from 1999-2011 echoes the colors of a Rothko painting. 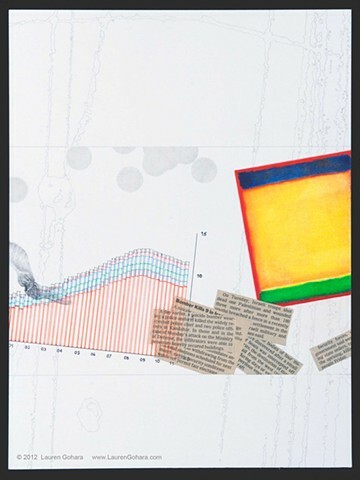 News clippings of reports of deaths from political violence intersect with the chart, but cover the tip of the Rothko.Pale graphite dots hover above, while particle physics tracks streak down in the background.